As Year-End approaches, it is a great time to help employees start thinking about how they can either start saving, or save better. Helping your employees understand “But why save in the first place?” is a great way for you to provide them with a secure future. Whether it is a down payment on a new home, a rainy day fund, or saving for retirement, here are 6 tips we have put together so employees can learn the essence of paying yourself first. By making regular RRSP contributions, employees get tax advantages such as tax-deductible contributions, tax-sheltered earnings, and tax deferrals. A benefit that’s being offered at more organizations is an employer matching RRSP, where your employer will match the contributions you make (up to a certain percentage) into a company owned plan. Although Sherry takes in a little bit more pay, she’s not taking into consideration of how she could be paying herself back when it comes to tax time or retirement– you can see how much more tax she pays to the government. Sherry has contributed to her RRSP and pays less tax. Her RRSP contribution is considered a taxable benefit, and she’s also paid towards her future so that she may be in a better position to retire down the road. 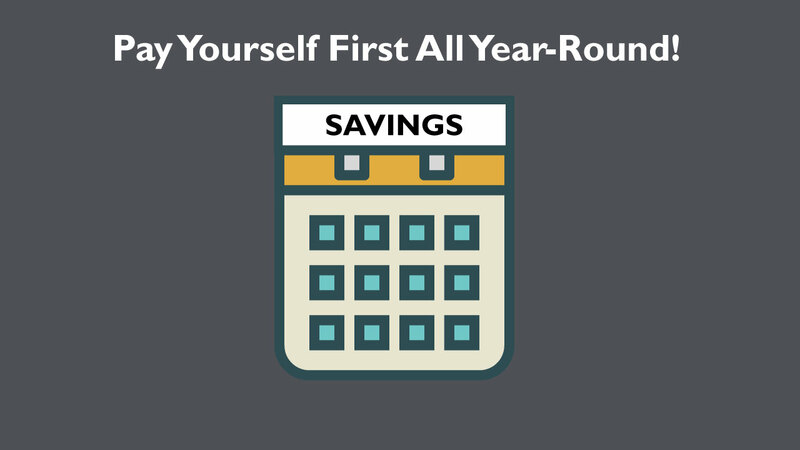 Don’t just spend that Year-End bonus on yourself, Pay Yourself First! In 2016, over 5.9 million Canadian taxpayers contributed to an RRSP, and if you’re one of them, then that’s even better news for you when it comes to Bonus time. Work with your employer to get that bonus right into an RRSP instead of right into your chequing account. If you’re already enrolled in a company owned RRSP, sometimes it’s almost as simple as emailing the proper authority and saying, ‘Make it so, move that bonus into an RRSP’. Saving never felt so easy, and tax free! By having that bonus go right into an RRSP, income tax is not deducted from the total amount, that means the entire bonus gets invested. Of course, you can always choose to either invest your entire bonus, or only a portion of it into RRSP. Now you’re starting to see the benefits of paying yourself first, but it can be difficult to remember to pay yourself first every pay day. That is why employees should take advantage of automating savings. With a little work up front, you can easily put your savings on auto-pilot. By choosing direct-depositing contributions, you no longer have to worry about it each month and it won’t get pushed aside. Did you know you can ask your employer’s Payroll team to deduct a certain amount from your pay and automatically put it in your RRSP? You can also set up automatic transfers with your financial institution, either online or at your local branch. Payroll Superheroes to the Rescue! We already talked about a few examples of how you can work with your Payroll team to Pay Yourself First. Here’s a great example below of how vested Canadian Payroll Professionals are in contributing to financial literacy and helping you see your contribution in Paying Yourself First! Above is an example of a pay statement at Coast Appliances (an Avanti Client) of what it would look like to Pay Yourself First by contributing towards a group RRSP. We’re well in the age of digital wallets and mobile pay, did you know that your phone can also help you save?! Here are a few different Canadian mobile apps and financial institutions that make it easy to round up and save that spare change when buying something. Saving a little bit each week goes further than you think! You can build those savings up for a down payment on your new home, an emergency fund, or retirement. If you saved this amount for the entire year (52 weeks) you would save $278.20! If you’re a fancy ‘triple shot latte with almond milk’ kind of person, you save even more! If you saved this amount for the entire year (52 weeks) you would save $364.00! Are Your Employees Experiencing Financial Stress? In a recent survey conducted by the Canadian Payroll Association, 44 per cent of working Canadians reported it would be at least somewhat difficult to meet their financial obligations if their paycheque was delayed by even a single week. We have compiled a few resources that assist in the process of creating a budget and getting to a place where an employee feels comfortable about paying themselves first. Hopefully these resources will serve as some inspiration for you and your employees to find the tools they need to improve their financial literacy and to pay themselves first. We created a guide that you can share with your employees digitally or even print and post up copies around the office to get everyone thinking about Paying Yourself First.